Many of you know that I love Asian food and if you follow me on Instagram you'll get a taste of that every week. This recipe is Korean inspired with simple flavors of lime, kimchi, and onions. 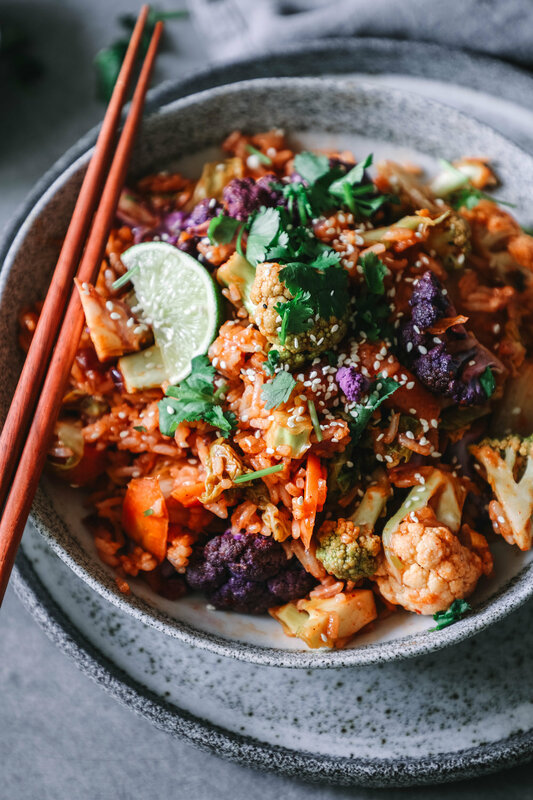 This fried rice is a healthier option for those Saturday nights you want to order take out and craving some Korean foods. Instead, you can have a blast with your partner as you cook this recipe and smell all the amazing aromas that come when you cook, onions, garlic, and ginger together. I'm happy to say this recipe has been one of my favorites since making it for my whole family. It’s made with Florida Crystals® Organic Brown Raw Cane Sugar, they are non-GMO project verified, and use their crops as fuel to generate renewable electricity. Aside from that, my family loved this recipe so much that I decided to share it with you guys. Toppings: cilantro, sesame seeds, black pepper, and lime juice. Cook the 1 1/3 cups of rice according to package, or pour rice and water into a rice cooker and press rice. Then heat oil in a large skillet or wok, add your onions and sauté for 5 mins. Lower heat and add minced garlic and ginger. Sauté for 3 mins. Turn off heat. Add your gochujang, mirin, soy sauce, salt, sugar, water, lime juice, and tapioca flour. Turn on heat to medium and mix well until a viscous mixture. Then add your cauliflower, carrots, and kimchi. Mix well for 5 mins. Finally, add the cooked rice to the skillet and add more salt if needed (mix well). Topped with more lime juice, sesame seeds, cilantro, and black pepper.